Zimbabwe lost millions of dollars after the country was brought to a virtual standstill by a highly successful mass stay-away engineered by the Zimbabwe Congress of Trade Unions (ZCTU) and social media group #ThisFlag. The protest brought the country to a total shutdown for three days as of yesterday, with industry and commerce grinding to a halt. The strike gravely affected the crucial foreign currency earning exporters. The government also knocked out the Internet, crippling social media and mobile phone operators' money-spinning data services. High density suburbs, which are normally abuzz with activity as well as the affluent middle, and low-density suburbs were all quiet. Supermarkets and pubs were closed. And even the oldest profession of prostitution was brought to a halt. Commuter omnibuses parked, literally crippling all movement of people, while very, very few cars could be seen on the roads. Transborder transport also suspended their services, leading cross-border traders stranded. Importers were also gravelly affected by the strike action. There was no activity in most suburbs in Harare and Bulawayo, which were the centres of the protests. Some vendors had their wares looted. In fact, the entire SMEs sector was affected. Over the weekend, ZCTU president Peter Mutasa together with #ThisFlag pastor Evan Mawarire successfully urged people to remain in their homes and not to report for work. According to Mutasa, the protest was meant for the government to remove the surrogate bond note currency, demand payment of salaries in United States dollars and a general improvement in the economic conditions in the country. "The biggest issue is that everyone is suffering, look at the kids in our schools, those in boarding schools are starving, look at those at tertiary schools, there are going to drop out as their parents are failing to make ends meet, we are earning low salaries, an average of $300 and now with the price increases of fuel and basic commodities, we are now working just for transport and we have decided as the ZCTU that this cannot go on, so we have got three key demands," Mutasa said. He said the protests would be peaceful, as people were asked to simply stay at home. However, following this announcement, several youths blocked highways and roads leading to the central business district (CBD). Zimbabwe has one of the highest numbers of unemployed youths in the region. With an unemployment rate of over 85 percent, the country has been in economic turmoil for nearly two decades since the violent land reform programme initiated by the government in the early 2000s. Several people had accused former president Robert Mugabe of running down the economy. But since his removal from power in November 2017 through a soft coup which elevated his former deputy Emmerson Mnangagwa to the presidency, people had hoped things would change for the better, but they have taken a turn for the worse. The cost of living has significantly increased, as salaries have been heavily eroded by inflation, while fuel, cash and foreign currency shortages have become the order of the day. Over the weekend, Mnangagwa announced a 150 percent increase in fuel prices, without implementing any cushioning measures for the workers and the general populace. This increased the temperatures, leading to the protests that dogged the country's main cities. On Monday, the youths who barricaded roads made it clear that reporting for duty yesterday would be a mistake, threatening to burn down all moving vehicles. In some instances, they asked for payment from motorists for easy passage, failure of which they threatened to smash the cars with stones. "We are only allowing you to pass today but tomorrow be warned that you must remain at home, otherwise you will regret," one of the young ruffians told a Daily News crew member on his way home on Monday. These threats resulted in schools, businesses and public transport grinding to a halt. 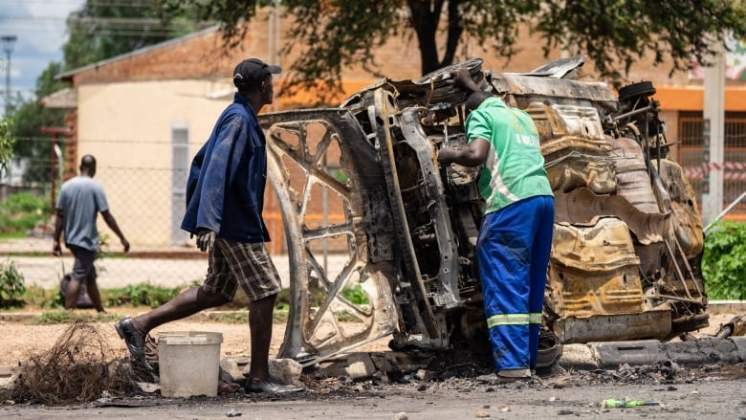 A survey by the Daily News showed that some roads in Harare were still blocked by large boulders yesterday, while incidents of violence were also reported in some of the hot spots. But yesterday government announced a "cushioning allowance" for State workers.